The funniest thing many of us Icelanders know how to do is to make foreigners taste our food. I have made countless “enemies” through the years while encouraging people to have a bite of shark with me, with a schnapps of course, to survive the experience. Fortunately for me they all survived and some are still thinking of how to get back at me for being so persuasive. I don´t know what it is. Probably the Viking in us wanting to show the world our super powers in being able to eat things such as rotten shark, sheep testicles, dried fish, sheep heads or Skata (something I guess you just have to come to Iceland to try, …to give you a clue, it smells worse than it tastes). 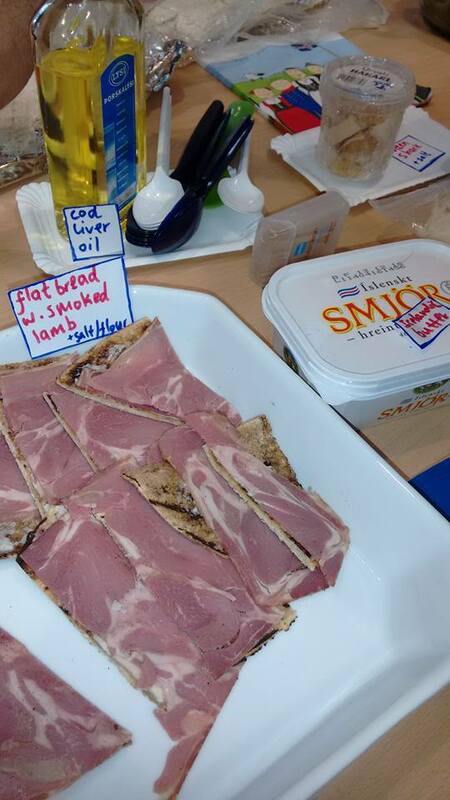 Smoked lamb, fish oil, butter, shark and other important delicacies in the Icelandic Viking food tradition. I could continue for a long time to tell you about which parts of the animal were eaten in Iceland before the days of refrigerators,but as I would like you to continue reading, I’ll stop for now. Because in Iceland we also have wonderful traditional things we enjoy such as smoked lamb. 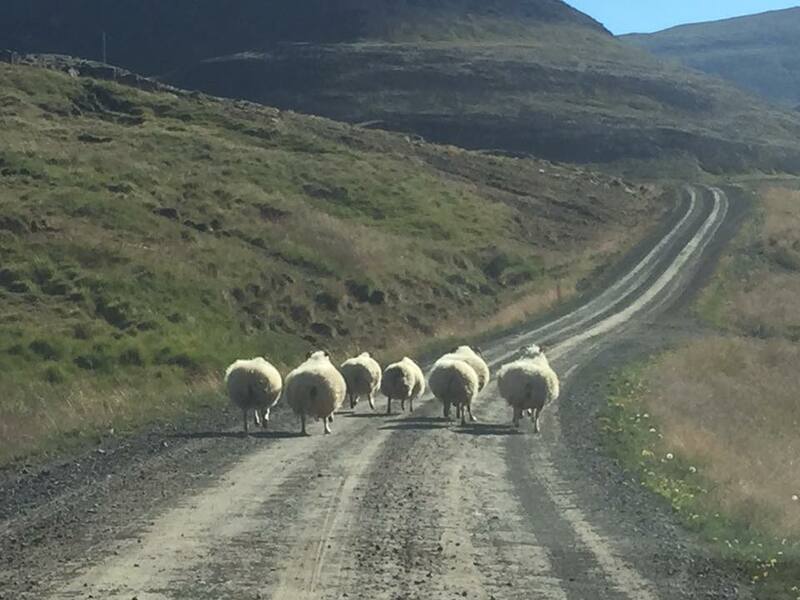 Lamb is sometimes referred to as mountain lambs or road lambs, as they run free in the Icelandic midnight sun during summer, mostly in the mountains but sometimes needing to cross a road (don´t we all). Mountain/Road sheep minding their own business. We are able to use our fantastic geothermal energy to grow tomatoes, lettuce, mushrooms and even strawberries in greenhouses. We have wonderful fresh herbs in the Icelandic nature and vegetables in autumn, such as potatoes, cauliflower and other root vegetables. What is for sure though is the amazing experience of having a good meal together, laughing, connecting and tasting something new, made with passion and traditions. This is valued all around the world. 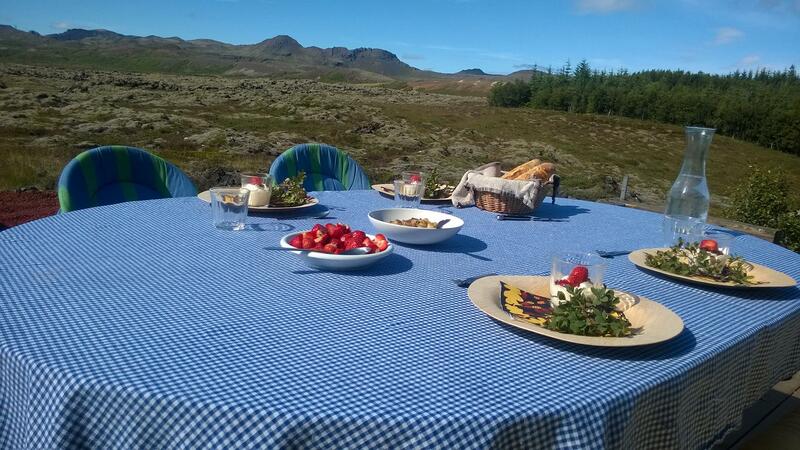 That´s why I started offering the Dining with the Icelanders experience three years ago. I met a lot of people that had had an amazing trip to Iceland but had never met any locals, and certainly not had dinner with them. 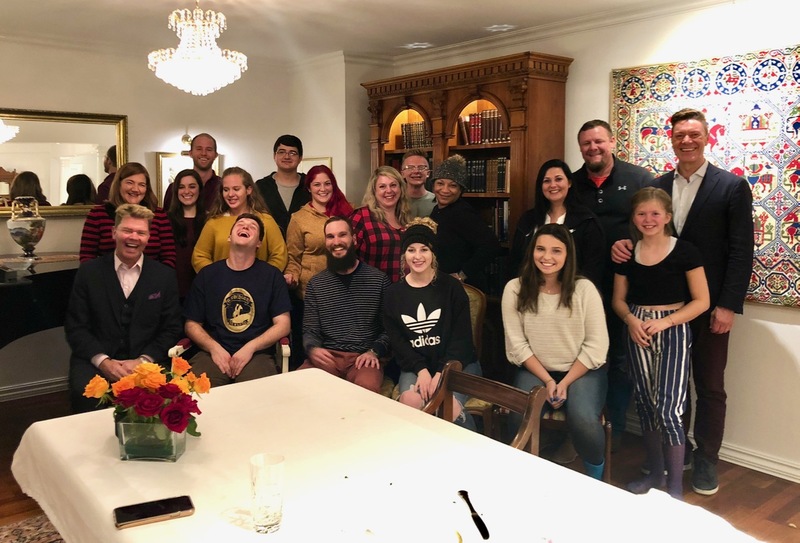 I have already planned many dinner parties in cooperation with my network in Iceland and the travelers have been thrilled with the experience and the uniqueness of meeting the Icelanders in their homes and connecting with them on a personal level. People have formed friendships and have even met again in other places around the globe. Many places in the world offer this experience to get to know the locals and in my opinion that is an important way to get the most out of your travel. It´s also an important way to make the world a bit smaller, to look your prejudice in the eye and to experience how human we all are. I am very fortunate. I have amazing hosts all around Iceland. They are as different as they are many, making it possible for me to offer a personalized service, connection and inspiration, all depending on the interests of the visitors. The group size depends on the needs of the travelers and everyone can enjoy the experience, big groups, small groups, families and individuals. Breakfast, lunch or dinner in nature makes everything taste even better. My hosts have a big passion for what they are doing , details are in place and some of them even go out in nature picking fresh mountain herbs for their guests or they go fishing or hunting before the meal to provide fresh Icelandic ingredients. No dinner party is the same as we are all have different approaches and the seasons change. I encourage you not to miss the opportunity to meet the Icelanders, connect, enjoy a meal and hopefully have a good laugh together. 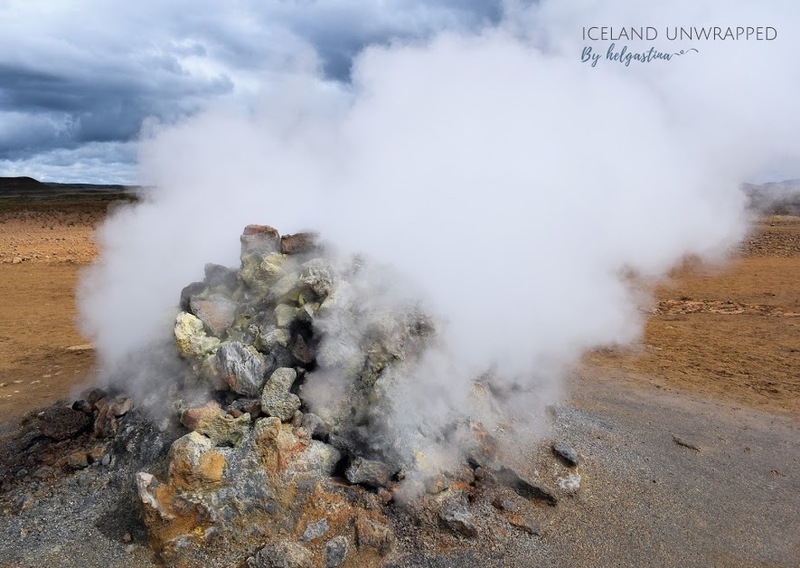 Geothermal energy is essential to the Icelanders daily life. No worries. Nobody will be forced to eat shark or other viking things as the dining experience offers you a home cooked meal, something the Icelanders would have themselves for dinner and nowadays most of us only enjoy viking food in the old month of Þorri, after the New Year.